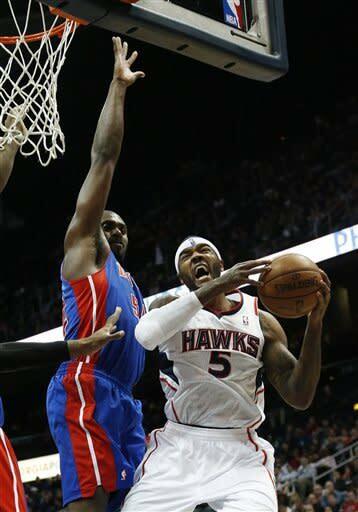 ATLANTA (AP) -- The Atlanta Hawks' penchant for going soft with a big lead nearly cost them another victory. 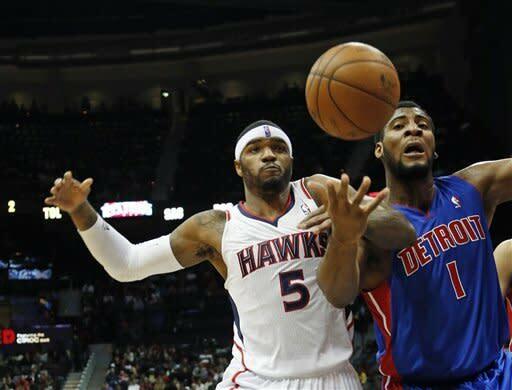 Josh Smith scored 31 points, Horford added 22 and the Hawks beat the Detroit Pistons 126-119 in double overtime on Wednesday night. 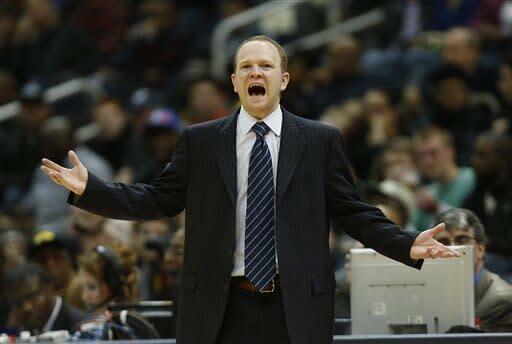 The Hawks blew a 22-point, fourth-quarter lead as Bynum and fellow reserve Charlie Villanueva scored a combined 26 of Detroit's 39 points in the final period of regulation. Atlanta has won two straight and eight of 12. Detroit has lost seven of nine. Bynum finished with 31 points, one less than his career high, and assisted on the last two baskets of regulation, when Andre Drummond's dunk cut the lead to two and Austin Daye's 3-pointer gave the Pistons a 101-100 lead with 4 seconds remaining. 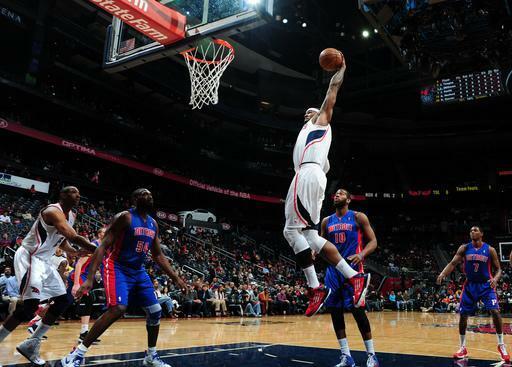 Horford followed by making just one of two free throws for the Hawks to force the first overtime. His second attempt bounced off the rim and into Daye's hands. After Jeff Teague's two free throws tied it at 108-all for Atlanta at the 1:05 mark of the first overtime, neither team scored again until Lou Williams hit a pair of free throws to give the Hawks a 110-108 lead early in the second overtime. 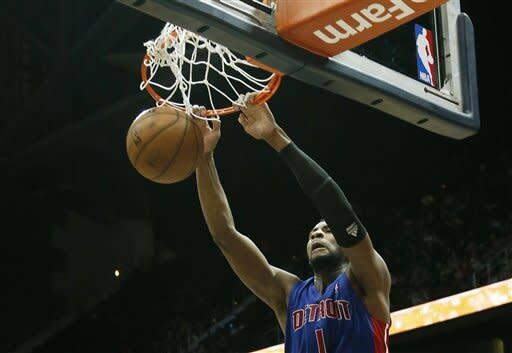 Bynum gave Detroit its last lead at 112-110 at the 3:03 mark. Atlanta never trailed after Teague's 3 made it 113-112 with 2:46 remaining. Reserves Rodney Stuckey and Drummond each finished with 16 points, and Tayshaun Prince and Villaneuva added 14 for the Pistons. Williams, starting for the second straight game, finished with 18. 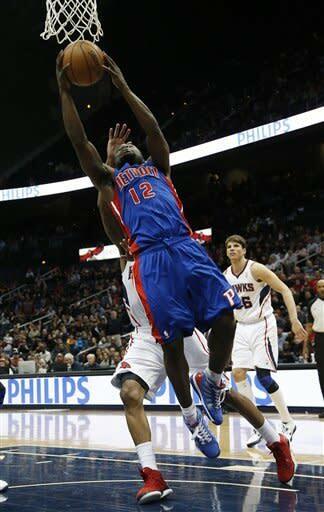 Teague had 17 and Anthony Morrow 16 for Atlanta, which outscored the Pistons 36-9 on fast-break points. 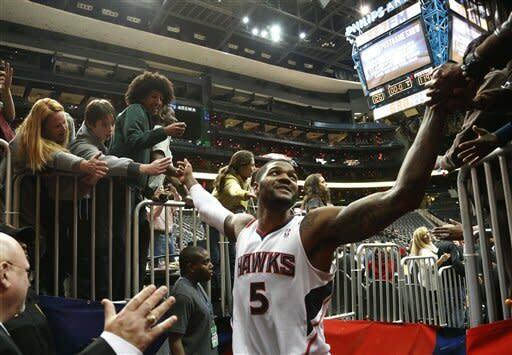 The Hawks were up by 22 early in the fourth quarter when DeShawn Stevenson's 3 from the left corner made it 84-62. But as Bynum kept driving the lane and beating the Hawks to the rim, Smith went cold for the Hawks, missing his last seven shots in the fourth and both overtime periods. Smith was 13 for 18 through the first three quarters. Both Bynum and Smith missed potential game winners at the end of the first overtime. Smith defended Bynum on a layup, but Villanueva played a role in successfully defending Smith's left-handed hook at the buzzer. For the Pistons, who were trying to earn a rare three-game winning streak, the loss dropped them to 3-14 on the road, 9-22 overall. There was little consolation for Bynum. 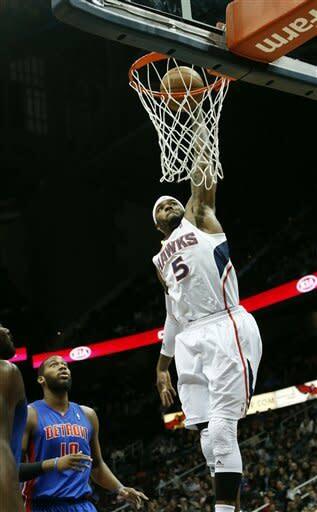 The Hawks improved to 10-5 at home, 17-9 overall. Notes: According to the Hawks' postgame notes, Detroit's 85 points off the bench were an NBA single-game high this season. ... Hawks G Devin Harris missed his fourth straight game with a sore left foot. ... Atlanta G Kyle Korver was 2-for-11 from the field. ... Smith's point total was his best since March 31 at Philadelphia, when he had 34. His high of 38 was on Nov. 17, 2007, at Milwaukee. ... Bynum's career high is 32 points, scored against Charlotte on April 5, 2009. ... Detroit's last three-game winning streak was last March 31-April 5 in a homestand against Charlotte, Orlando and Washington.